Using the latest in imaging technology, the Division of Musculoskeletal Imaging (MSK) performs a full range of image interpretation and image-guided intervention procedures related to bones and joints. In addition to diagnostic services, the division also specializes in minimally invasive pain management therapies that can often be an effective alternative to surgery. Our MSK physicians specialize in bone and joint imaging, spinal imaging, metabolic bone disease, and osteoporosis. 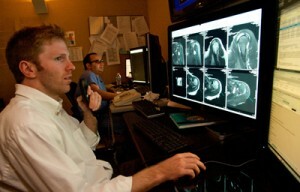 Imaging techniques include plain films, CT, Ultrasound, and MRI. For diagnostic purposes, the division also performs plain films, arthrography, bone biopsies, and peripheral soft tissue lesions. We collaborate with numerous departments within the UVA Health System such as Sports Medicine, Orthopedics, Rheumatology, Radiation Oncology, Pathology, Neurosurgery, and others. In addition, MSK physicians provide pain management services to patients receiving care through the UVA Spine Clinic. For diagnosing and treating pain originating in the spine, we administer image-guided nerve blocks, epidurals, and joint injections. Consultative services are also provided for complex cases to determine the imaging strategy best suited for each individual situation.